You may see offers for genetic testing for AMD. Because AMD is influenced by so many genes plus environmental factors such as smoking and nutrition, there are currently no genetic tests that can diagnose AMD, or predict with certainty who will develop it. The American Academy of Ophthalmology currently recommends against routine genetic testing for AMD, and insurance generally does not cover such testing. Late AMD. In addition to drusen, people with late AMD have vision loss from damage to the macula. There are two types of late AMD: o In geographic atrophy (also called dry AMD), there is a gradual breakdown of the light-sensitive cells in the macula that convey visual information to the brain, and of the supporting tissue beneath the macula. These changes cause vision loss. o In neovascular AMD (also called wet AMD), abnormal blood vessels grow underneath the retina. (“Neovascular” literally means “new vessels.”) These vessels can leak fluid and blood, which may lead to swelling and damage of the macula. The damage may be rapid and severe, unlike the more gradual course of geographic atrophy. It is possible to have both geographic atrophy and neovascular AMD in the same eye, and either condition can appear first. If you have intermediate or late AMD, you might benefit from taking such supplements. But first, be sure to review and compare the labels. Many of the supplements have different ingredients, or different doses, from those tested in the AREDS trials. Also, consult your doctor or eye care professional about which supplement, if any, is right for you. For example, if you smoke regularly, or used to, your doctor may recommend that you avoid supplements containing beta-carotene. Even if you take a daily multivitamin, you should consider taking an AREDS supplement if you are at risk for late AMD. The formulations tested in the AREDS trials contain much higher doses of vitamins and minerals than what is found in multivitamins. Tell your doctor or eye care professional about any multivitamins you are taking when you are discussing possible AREDS formulations. You may see claims that your specific genetic makeup (genotype) can influence how you will respond to AREDS supplements. Some recent studies have claimed that, depending on genotype, some patients will benefit from AREDS supplements and others could be harmed. These claims are based on a portion of data from the AREDS research. NEI investigators have done comprehensive analyses of the complete AREDS data. Their findings to date indicate that AREDS supplements are beneficial for patients of all tested genotypes. Based on the overall data, the American Academy of Ophthalmology does not support the use of genetic testing to guide treatment for AMD. Finally, remember that the AREDS formulation is not a cure. It does not help people with early AMD, and will not restore vision already lost from AMD. But it may delay the onset of late AMD. It also may help slow vision loss in people who already have late AMD. • Injections. One option to slow the progression of neovascular AMD is to inject drugs into the eye. With neovascular AMD, abnormally high levels of vascular endothelial growth factor (VEGF) are secreted in your eyes. VEGF is a protein that promotes the growth of new abnormal blood vessels. Anti-VEGF injection therapy blocks this growth. If you get this treatment, you may need multiple monthly injections. Before each injection, your eye will be numbed and cleaned with antiseptics. To further reduce the risk of infection, you may be prescribed antibiotic drops. A few different anti-VEGF drugs are available. They vary in cost and in how often they need to be injected, so you may wish to discuss these issues with your eye care professional. • Photodynamic therapy. 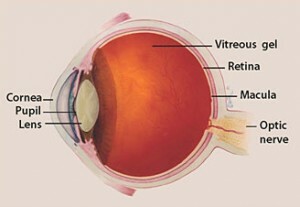 This technique involves laser treatment of select areas of the retina. First, a drug called verteporfin will be injected into a vein in your arm. The drug travels through the blood vessels in your body, and is absorbed by new, growing blood vessels. Your eye care professional then shines a laser beam into your eye to activate the drug in the new abnormal blood vessels, while sparing normal ones. Once activated, the drug closes off the new blood vessels, slows their growth, and slows the rate of vision loss. This procedure is less common than anti-VEGF injections, and is often used in combination with them for specific types of neovascular AMD. • Laser surgery. Eye care professionals treat certain cases of neovascular AMD with laser surgery, though this is less common than other treatments. It involves aiming an intense “hot” laser at the abnormal blood vessels in your eyes to destroy them. This laser is not the same one used in photodynamic therapy which may be referred to as a “cold” laser. This treatment is more likely to be used when blood vessel growth is limited to a compact area in your eye, away from the center of the macula, that can be easily targeted with the laser. Even so, laser treatment also may destroy some surrounding healthy tissue. This often results in a small blind spot where the laser has scarred the retina. In some cases, vision immediately after the surgery may be worse than it was before. But the surgery may also help prevent more severe vision loss from occurring years later. • Learn more about your vision loss. • Visit a specialist in low vision and get devices and learning skills to help you with the tasks of everyday living. • Try to stay positive. People who remain hopeful say they are better able to cope with AMD and vision loss. • Stay engaged with family and friends. • Seek a professional counselor or support group. Your doctor or eye care professional may be able to refer you to one. This online resource guide provides information about macular degeneration. It answer questions about its causes and symptoms, and discusses diagnosis and types of treatment. It was adapted from Don’t Lose Sight of Age-Related Macular Degeneration (NIH Publication No. 02-3462) and Age-Related Macular Degeneration: What You Should Know (NIH Publication No. 03-2294).